Microsoft SharePoint is a Web-based software platform designed for collaboration and sharing of information. It offers secure, centralized access to enterprise information and is useful for digital record management that meets government and industry compliance standards. SharePoint is a user-friendly product due to its tight integration with Microsoft Office suite and a Web-based interface. SharePoint does so much, it is almost impossible to define it in a few words. It is a CRM solution, a personal organizer, a shared calendar, a contacts database, an interactive Web site, a document management system, a records management tool, a social networking platform, and so much more. Although SharePoint is easy to use, if you don’t follow certain guidelines and best practices you can end up wasting valuable time and resources. 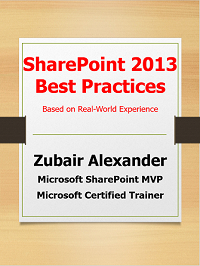 This eBook contains the recommended best practices from a Microsoft MVP and SharePoint consultant Zubair Alexander who has over a dozen years of SharePoint experience in the industry as a trainer, consultant, author, courseware developer and public speaker on SharePoint topics. By following the best practices documented in this eBook, you will be better equipped with the knowledge to ensure that you are using the proper site template that suits your business needs, save time, work faster and smarter, avoid common pitfalls, organize your metadata and content better, enhance security of your data, and speed up the process of searching your content to get a better return on your investment. Purchase the PDF version of the eBook. Purchase the Kindle version of the eBook. Looking for Best Practices for SharePoint 2010? 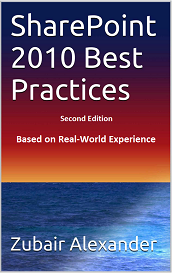 SharePoint 2010 Best Practices eBook is available for purchase from SeattlePro (PDF Edition) or Amazon.com (Kindle Edition). Click the image below for details.